Frankie Frisch found World Series success wherever he played, helping the New York Giants and St. Louis Cardinals to eight total appearances and four World Series titles. 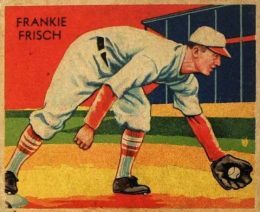 Despite the early period in which he played, Frankie Frisch baseball cards bridge the time period from tobacco/candy-era sets, like 1922 American Caramel, to popular vintage releases such as 1950 Bowman. 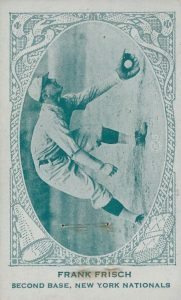 Take a look at some of Frisch's best baseball cards including several options from notable Goudey sets. Frisch first made a name for himself on the base paths at Fordham University, earning the moniker, the "Fordham Flash." After being signed by the New York Giants in 1919, he went straight from college to the majors. Frisch developed into one of the best second basemen of his era and also one of the top base stealers. Traded by the Giants to the Cardinals for Rogers Hornsby, Frisch became a key member of the "Gashouse Gang," winning World Series championships in 1931 and 1934. Shop for Frankie Frisch Baseball Cards on eBay. Although he played in the 1920s and '30s, more recent Frisch cards are included 2016 Panini Flawless. Among the options are both cut autographs and bat relic cards with other stars of his day. He can also be found in 2015 Panini Cooperstown and 2015 Diamond Kings with several bat relics for collectors to fight over. Those on a budget can look to less expensive Frisch appearances from the 1950s and 1960s. The 1950-56 Callahan Hall of Fame set, issued by the Baseball Hall of Fame, honors his election to Cooperstown in 1947. Along with his cards in the Bowman sets of the 1950s, Frisch also was featured in 1961 Fleer Baseball Greats. In addition, colorized photo cards in the 1961 Golden Press Hall of Fame set came in a book that collectors could separate from the pages. 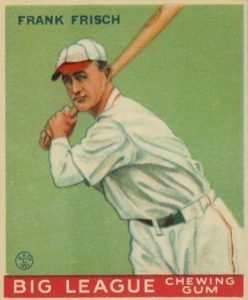 Like many stars of his era, Frisch doesn't have an official rookie card in the same way today's players do but his earliest releases came in 1920, 1921 and 1922. These remain scarce. In constructing this list of the best Frankie Frisch cards, value was the main component along with availability and hobby popularity. The Diamond Match Company began featuring baseball players on their packaging in 1934 and they issued several different sets over the next four years. The first group of 200 matchbooks is known as the Silver Border set because of the silver that surrounds the sepia player photo. Frisch was featured in several of the releases and the value of each matchbook is cut significantly if the photo is separated from the career summary. The removal of the matches themselves, however, is the preferred way to collect these oddities of the 1930s. The 1936 National Chicle photo cards earned the Fine Pen name for the relatively thin and tiny facsimile autographs that accompany each card. These cards were issued as an in-store giveaway for buying National Chicle gum and were not a separately issued product. Frisch's photo features a good look at his wool jersey featuring the Cardinals logo across the front of his chest. After running afoul of New York Giants manager John McGaw, Frisch was traded to the Cardinals following the 1926 season for future Hall of Fame member Rogers Hornsby. 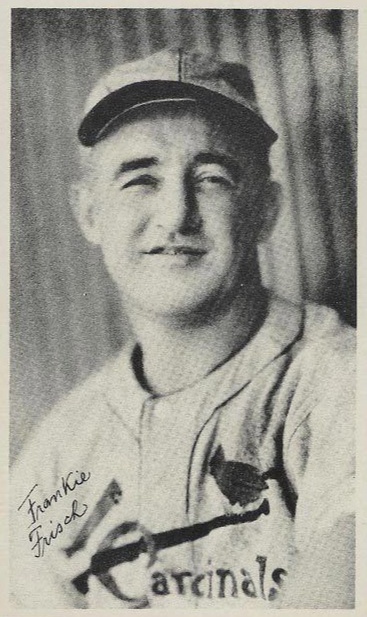 After serving as player/manager for the Cardinals from 1933 to 1938, Frisch also managed the Pittsburgh Pirates and Chicago Cubs in the 1940s and '50s. 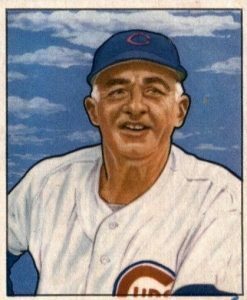 He is featured in 1950 and 1951 Bowman as the manager of the Cubs and both cards have the same image. Eagle-eyed collectors may notice a small blue dot in the lower-right corner of Frisch's card. At first glance, you might think it is a pen mark, but this was a print defect found on all of his 1950 Bowman cards. Later reprint versions of the set would remove the blue dot. Frisch played only 93 games in 1936 and just 17 more in his final season in 1937. You can almost see his 19-year career on his face with the 1936 Goudey Wide Pen card. Most cards in the set display a portrait photograph with a facsimile signature that features wider lettering, hence the set's nickname. 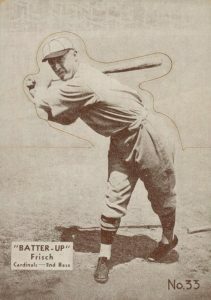 Frisch was one of the best switch-hitters to ever play the game and his career .316 average is the highest among switch-hitters. He and Chipper Jones are the only players with career averages above .300 from both sides of the plate. Collectors who enjoy piecing together a rainbow of color variations for a certain card face an uphill task with the 1934-1936 Batter Up set. This is because each card is valuable and there are many colors available, including purple, black, blue, green, pink, and brown (featured below). Frisch took home the 1931 National League MVP award as well as the stolen base title, making him one of the most popular players of his day. 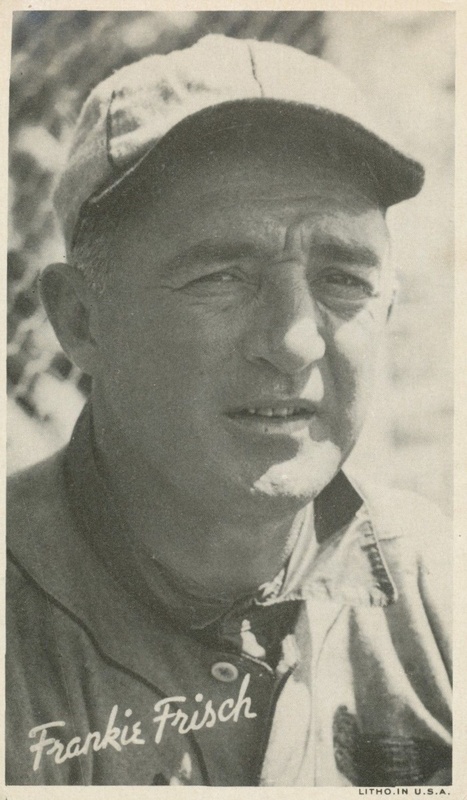 As Play Ball expanded their checklist from the 1939 set to 1940 Play Ball, many retired legends were added, including Frisch, who was managing the Pittsburgh Pirates at the time. Frankie managed the team from 1940 to 1946 but he was never able to capture the World Series success as a manager that he experienced as a player. One of the earliest Frankie Frisch cards can be found in 1922 American Caramel which featured 240 stars of the day. 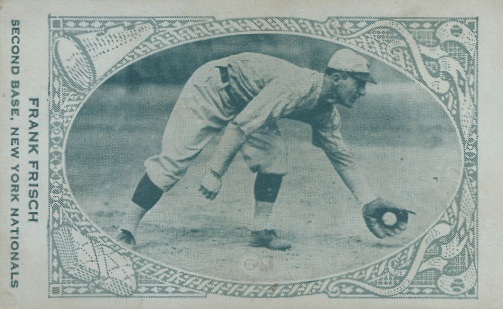 The cards of National League players (including Frisch) were printed on bluish-green paper stock and American Leaguers were printed on cream colored stock. As you'll notice in Frisch's case with the next card on the list, many of the photos used in the set were featured again and again in other releases. Frisch's card is positioned vertically but the image is best viewed on the side making for an odd design choice. The Fordham Flash's card in 1934-1936 Diamond Stars can be found with two different backs: one with 1934 information and one with 1935 information. The photo is a colorized version of the image used in E120 American Caramel of Frisch fielding a grounder. An amazing second baseman, Frisch set the record for assists in a season by any position with 643. 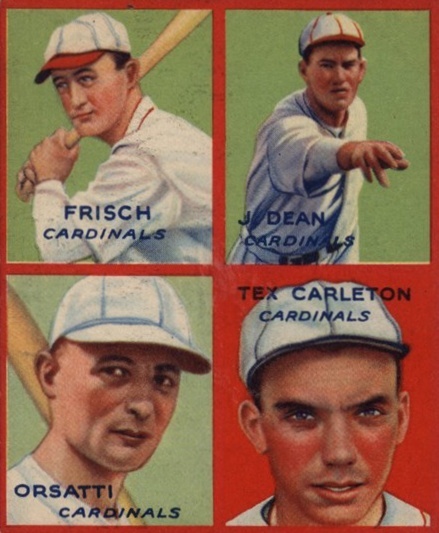 Teammates were often featured together in 1935 Goudey 4-in-1 and Frisch is part of a Cardinals card. The team was incredibly popular at the time as they had captured the 1934 World Series by beating the Detroit Tigers. Tex Carleton and Dizzy Dean anchored the pitching staff while Ernie Orsatti was an outfielder. The reverse side of these cards could be combined together to form larger puzzles. The top Frankie Frisch baseball card comes in the iconic 1933 Goudey set. Swinging from the left side of the plate, the stance is reminiscent of his Batter-Up card. 1933 was Goudey's first entry into baseball cards and "Frankie" is just "Frank Frisch" on the front of his card. 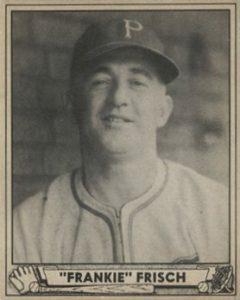 Frisch would also appear in 1934 Goudey with an identical image and some small background detail added. At auction, excellent graded copies can approach $400 with those rare near-mint copies attracting prices many times that. 1933 Goudey #49 Frankie Frisch HOF Cardinals SGC 20 ! !